Design an attractive site optimized for both mobile and desktop browsing. Create content to populate your site (articles, blog posts, etc.). Manage your online reputation (encourage patients to fill out surveys, leave reviews). Support online patient forms, online appointment booking. Improve your site's search ranking performance with Search Engine Optimization (SEO). Many of these components may require an ongoing time commitment, such as generating original, thoughtful content in order to attract and engage readers. Advertising through Google AdWords or Facebook Ads can also require a substantial amount of expertise in order to make sure that you're targeting the right audience, and spending your advertising budget efficiently. Though online marketing can require a substantial amount of effort to get set up, it's also one of the best ways to build your chiropractic business. By marketing your business in a more traditional way (e.g speaking at local events), you can only reach the people who attend those events. In contrast, if you have a powerful web presence, anyone who searches for chiropractors in your area can potentially become a client. Many chiropractorors realize this, and have spent considerable effort on optimizing their web presence. This means that you'll have to put in a substantial effort in order to stay competitive, which can be a full time job in and of itself. How do chiropractors build their websites? With all of the technical expertise and effort required in order to create a powerful web presence, it's not surprising that many chiropractors choose to outsource this work to freelance web developers, or to companies that specialize in creating chiropractic-specific websites. You can also make a basic website using website builders like WordPress, Wix, or Squarespace. Wix is especially easy for first timers, and can help you build a basic website quickly for free, or for about $180/year using their most popular package. 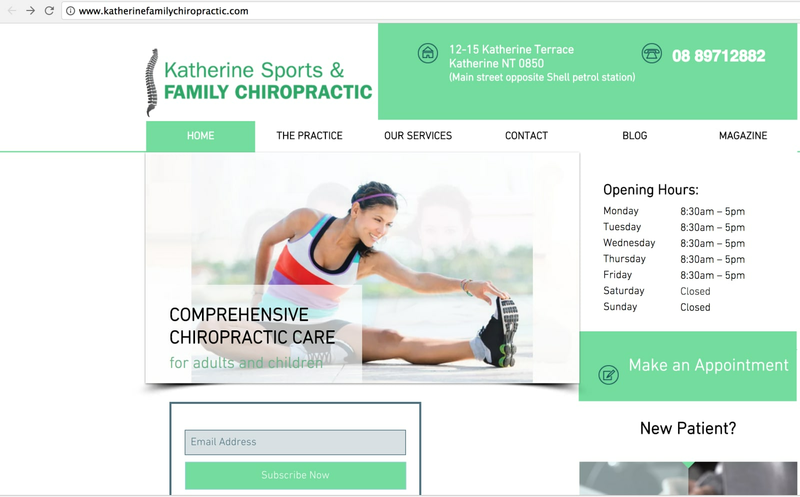 Here's an example of a chiropractic website built with Wix, from Katherine Chiropractic. Though Wix is very easy to use and set up, you'll have to start with a relatively bare bones website, and add content from there, which can take some time. There may also be some features that are lacking, such as reputation management, or that may come with an additional fee. However, even if you pay for some of the more premium capabilities, Wix is still one of the fastest and most cost effective ways to get a simple website up and running. Since some chiropractors are intimidated by Wix (don't be! ), many opt to pay for chiropractic website services. Some of the most popular chiropractic marketing website businesses are ChiroMatrix, Inception, Chiroplanet, and Perfect Patients. These services specialize in providing you with a complete website and provide you with everything you need to manage your online presence. However, they can cost anywhere from $80-$1000+ per month, and some of them also require a setup fee of a few hundred dollars. 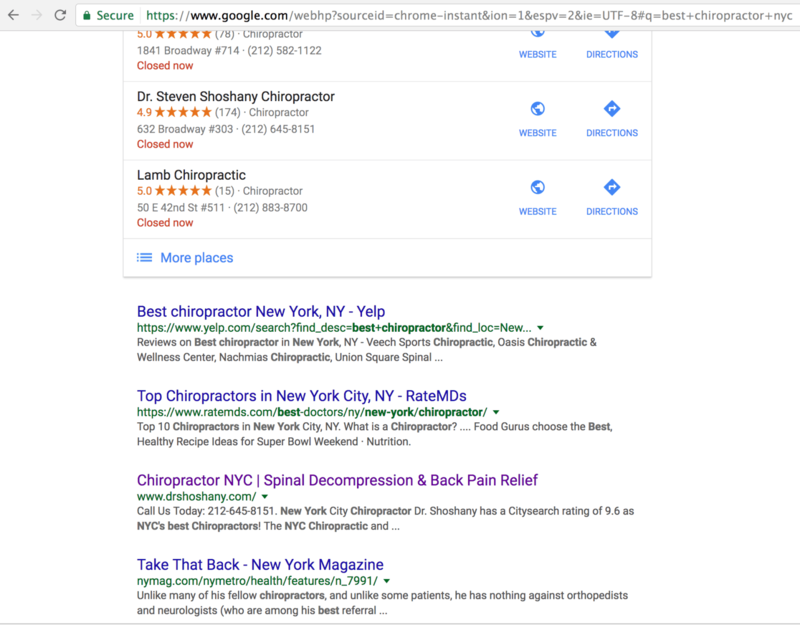 To get an idea of how popular these services are, let's conduct a search on Google for "best chiropractor nyc". The first result from a chiropractic practice that shows up is Dr Shoshany's website, which says that it was built by ChiroMatrix. We suggest that you try searching on Google for competing chiropractic practices in your area, in order to see how sophisticated their websites are. This can give you a sense of how much time and money you should invest in your website. Though these services are popular and can be a great way to get your website up and running quickly, there are some things you should keep in mind before making the decision to invest. Many services advertise that they can populate your site with chiropractic-specific content (articles, blog posts). In general, having content on your site is important, since it leaves a positive impression on potential clients, keeps them engaged, and gives them more opportunities to directly contact/set up an appointment with your practice. Having good content on your site also positions you as a credible, authoritative source of information about topics relevant to your specific field. By populating your page with content from one of these services, your page will look full of content, even from the very beginning. Whereas if you build the site yourself, you'll have to spend the time to populate it with your own content. However, these services publish content and let anyone who pays for their services use the same content on their site. This means that there can be thousands of websites containing the exact same article, word for word. Although some suspect that duplicate content can have a negative impact on your SEO ranking, Google claims that there's no penalty, but it may not help your ranking. This is especially important if you're located in a competitive area, with many other businesses who are using the same services. If other businesses in your area are using the same content, then you will have to find another way to differentiate yourself. For this reason, we suggest that you invest the time in creating meaningful, original content that potential clients will find engaging. Not only will your content be superior and more specific to your business, but it can also increase your SEO ranking, compared to others who are using the canned content from these services. Most services will also enable you to select if you want to use specific canned articles, or none at all. Though it's reasonable to use these services to save time, create a website, and quickly populate it with some content from the start, there's no substitute for supplementing that content with some original articles of your own, to distinguish yourself from the rest of the pack. If you examine Dr. Shoshany's site closely, you can see that there's a lot of canned content from ChiroMatrix. However, the site also contains a lot of original content, including youtube videos, and videos of Dr. Shoshany himself on Dr. Oz. 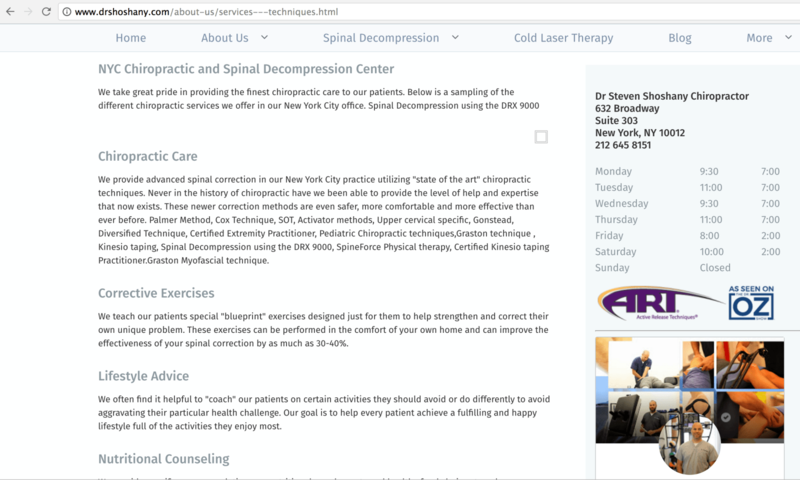 This is why Dr Shoshany's site is able to rank so highly in a competitive market like NYC, even though it contains some duplicate content. For most chiropractic practices, paying $1,000/month for the higher-end packages is way too much, and unnecessary. However, it can be an excellent idea to pay ~$80/month for the more basic packages to get a well-designed website up and running, assuming that you're willing to spend the time to handle other tasks (like content generation) on your own. This can be a quick and easy way to get a head start on your website, and begin marketing your practice online. However, it's important to understand that the lower end packages still end up costing substantially more than making a website through Wix -- the tradeoff is just that Wix may require a bit more time to populate with content, and design. Alternatively, you can hire freelance web developers who will have a higher upfront cost, and will require time and extra hand-holding to get the site looking exactly how you want it. The benefit to taking this approach is that you'll have full control over your website, and can create the site entirely from scratch to suit your needs. This is a higher short-term investment both in terms of time and money, but can be more cost-effective in the long run compared to paying a monthly fee for a chiropractic website service. And compared to Wix, you can create a much more powerful site designed specifically for your needs. If you're making your first website, you should launch a basic version of your website as fast as possible for as little money as possible. This is so that you can quickly start marketing your business online, and understand its benefits, without paying a high upfront cost. This means that if you're just starting your first website, we'd suggest either creating it yourself using a website builder like WordPress or Wix, or by paying for a basic package from a chiropractic website service which will build and launch the site for you. Some chiropractors may be intimidated by the prospect of creating a website themselves, but you can read our guide to quickly create a basic site using Wix. Depending on which package you select, you can either create your site for free, or pay $180 for the most popular Wix package with your own domain name. Using Wix is the most cost effective option, but it takes some time to design the site and populate it with content. If you prefer to pay a little more but save on time, then using a chiropractic website service such as ChiroMatrix, Inception, Chiroplanet, or Perfect Patients is also a viable option. These services will cost about $80/month for their most basic packages. However, if you go this route, we still recommend that you invest the time in creating original content, and that you don't lean too heavily on the canned content. Once you have more experience with running a website and have a better understanding of what your clients would like to see in your site, then it makes sense to work with an experienced web developer to build a custom site that has all of the functionality that you want. This option has the highest upfront cost and still requires a significant time investment, but also the highest potential benefit. No matter which approach you choose, there's no substitute for creating original, engaging content for your clients. Not only will this give potential customers a positive impression of your business, but it will also help your SEO ranking and help to distinguish you from your competitors.